Today's the day!! We have officially launched our new school year today and man oh man, it was a FANTASTIC day. I was super nervous because I am now home schooling two children and was worried about how I would fit two children in and get done with them everything that they needed to accomplish. Well, it went so smoothly, I just about cried. God is so good!! My just turned 7 year old has been reading through the summer and she is reading so well and fluently now. We struggled with reading last school year so it is such a relief that she is reading this well now. My 5 year old started Kindergarten and he did really great today as well. I am trying to stay animated, enthusiastic and encouraging through everything and he seems to be on board. I was worried about him but he was totally into it today and I hope it stays that way in the months to come. :) Home schooling is the BEST. Because of this passion, the Contigo brand is now a leading innovator of Travel Mugs, Water Bottles and Kids Bottles. Our first innovation was our patented AUTOSEAL® technology which was designed to automatically seal between sips so you never have to worry about spilling another drop. We originally launched this revolutionary feature on a travel mug (to tackle the coffee dribble down the shirt issue) and because of it's popularity we came up with new ways to apply it a variety of stylish water bottles and kids bottles. AUTOSEAL is now America's #1 Selling* line of travel mugs. Priding ourselves on delivering innovative designs to meet evolving needs, next we developed our patent pending AUTOSPOUT® technology. Understanding that many of us prefer drinking from a straw, we made staying hydrated as simple as a touch of a button. Whether you're at the gym, in school, in the office or at home, AUTOSPOUT Water Bottles feature a pop-up spout for easy one-handed drinking so you never have to take your eyes off your activity at hand. Sorry that was a bit long but I thought it would be beneficial to share the whole story with you so you could get the big picture of what Contigo is all about. 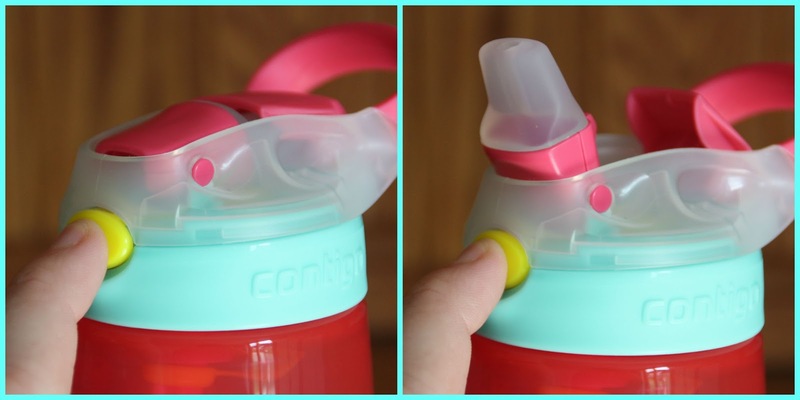 I have heard of Contigo before but I don't think I have ever had one before so it was great to receive the opportunity to review their products. 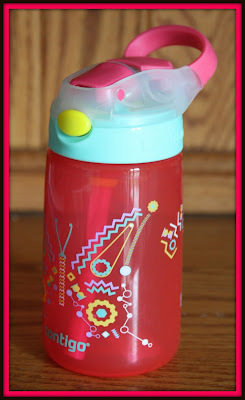 So, for this review I was sent one of their pink Contigo AUTOSPOUT® Gizmo Flip Water Bottles. Because I have two little girls, it was a no brainer to get a pink one. They also have a blue one for little boys. This is a 14 ounce water bottle that comes with a cute, girly design on it and a see-through bottle. There are several things that I love about this bottle. 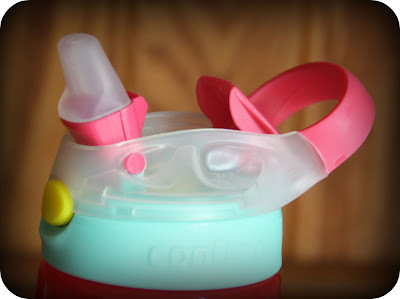 The first thing is that it has a nice rubber carrying handle which makes it easy for little hands to take this bottle anywhere. The second thing that I love (which took me forever to figure out, haha!) is the push button AUTOSPOUT feature. The way this AUTOSPOUT feature works is simple. All you do is press the yellow button located right below the sippy spout and the spout pops up. It took me a few minutes to figure out how this worked but once I figured it out, I thought it was a really cool idea! It keeps the spout protected and clean when not in use and eliminates spills and leaks. This is wonderful, especially if you are putting this bottle into a lunch box, backpack or other place. I found that the inside of this bottle is super easy to clean as well. The straw can be disconnected but stays attached with the yellow piece so you don't lose the straw. 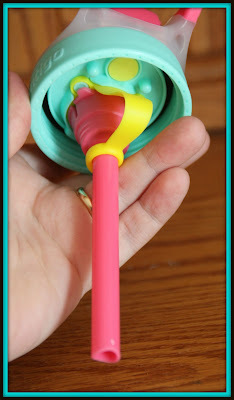 Personally, I think this is a great idea because straws get misplaced so easily. 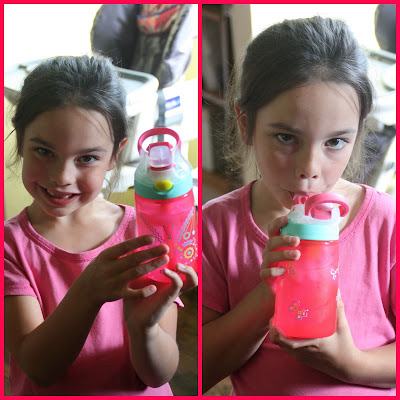 So, how did my daughter like using this Contigo AUTOSPOUT® Gizmo Flip Water Bottle? Well, lets just say that it has gone just about everywhere with her. We went on a hike yesterday in the woods and she carried it the entire way. It has also gone to church and in the car for every car ride. I think it is safe to say that she absolutely LOVES it! She is getting too big for sippy cups so this makes a perfect alternative for her. You can purchase this and other innovative water bottles at Contigo.com and it retails for $9.99. 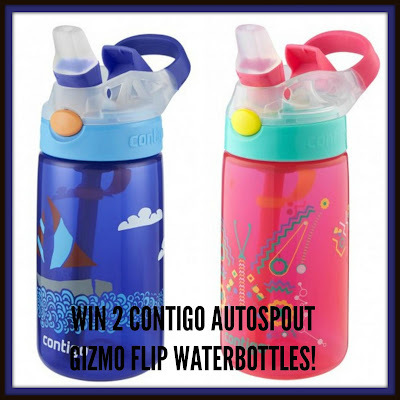 Also, be sure you stop on by Contigo's Facebook and Twitter pages as well---there is always something fun and exciting happening there so don't miss out on anything! I would like to try the 32 oz. AUTOSPOUT® Addison Water Bottle . I really like the Scout Food Jar. It would be nice to use in the car on trips. I would love to try the travel mugs. I like the extreme stainless travel mug. I'd like to try the AUTOSPOUT® Sheffield Stainless Water Bottle, too! I like the Purity Glass Water Bottle! I would love to try the Ashland Water Bottle! I want to try the Autospout Ashland Water Bottle. I would love to have the Auto Spout Ashland Water Bottle for myself! I like the Purity Glass Water Bottle. I also like their Autoseal Pitcher Set. I would also love to own the Autospout Ashland Waterbottle from Contigo. I like the 20 oz. AUTOSEAL® Fit Stainless Water Bottle. I think the Scout found jar looks awesome. Thanks for this opportunity! 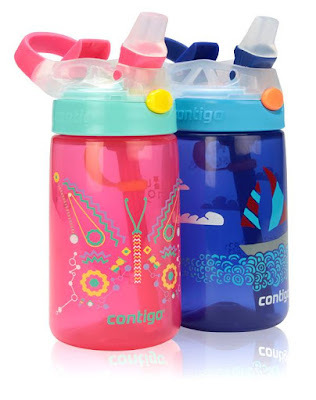 Love Contigo products! I like the 18 oz. AUTOSPOUT® Waveland Insulated Water Bottle. I want the travel mugs. I would also love to have the Anna Ceramic Desk Mug. AUTOSPOUT® Sheffield Stainless Water Bottle is my favorite.